Bedroom #1. King bed with its own private bathroom and deck. Bedroom #2. Queen bed with its own private bathroom. Bedroom #4. Large bedroom with two double beds and two double beds lofted. Bedroom #5. Unique set of bunk beds with a twin on top, double on bottom, and a pull-out double trundle bed. Located in a privately owned community, the house is only 100 steps to the beach where lifeguards are available for safety and to rent chairs and umbrella. There is also an indoor pool, 3 outdoor pools, water park, lazy river, and 2 oceanfront playgrounds on site as well as many other amenities.The house is located just 10 minutes from the heart of Myrtle Beach and 15 minutes from Broadway at the Beach. With the community's 24-hour security, you can feel comfortable letting the children go. There is miniature golf, indoor/outdoor pools, water park and lazy river, volleyball, basketball courts, horseshoe pits, shuffleboard, biking, golf cart rental, bingo, church services, fishing, recreation center with ping pong tables, snack bar, playgrounds, organized activities for all ages, plus much more! 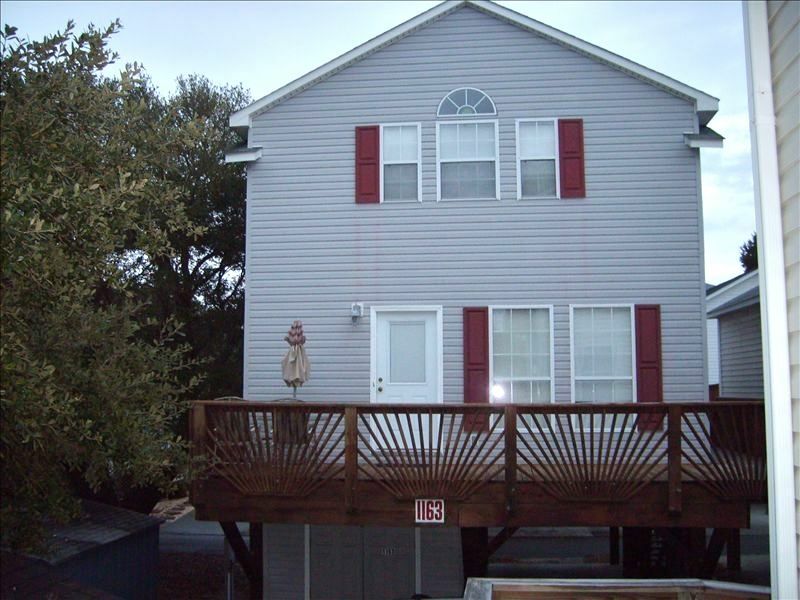 Located close to all Myrtle Beach attractions such as golfing(over 100 courses! ),amusement parks, shows, outlet malls, museums, etc. Linen service available for $100. They will provide all your bed linens, bath towels, washcloths, and kitchen towels. Golf cart rental available upon request. Prices vary depending on the season. Baby item rentals Port-a-crib and High Chair available upon request. $25 per item. Tennis courts 10 minutes from the house. Golf courses within a 10 minute drive.